If you’ve played any Mario Kart game, you know the recurring Rainbow Road Track. 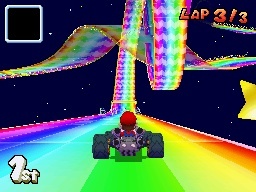 Each Mario Kart game has a new version of Rainbow Road, and while they are all different, the same theme applies to each Rainbow Road track. Outer Space, a road in the colors of the rainbow, and always a great course; now to get hyped for Mario Kart 8, lets go through the best 5 Rainbow Road courses! Super Circuit has every SNES track along with the new tracks, so I was able to try both games’ tracks for the first time. I found the new Rainbow Road superior, and I found the SNES Rainbow Road to be pretty average, other than the fact it was colorful. Super Circuit’s Rainbow Road also leaves a huge amount of room for shortcuts; if you use a mushroom you can take a huge jump off of the edge of the track, and with practice, you can cut tens of seconds off of your race time. Try watching a time trial of this Rainbow Road and you’ll see what I mean. It seemed like every time I would play Mario Kart DS’ Rainbow Road online I would get destroyed, partially because everyone would fly by me since they were really good at snaking, and partially because it was just a hard track. While it was still a fun track, there were other tracks in Mario Kart DS that were better. 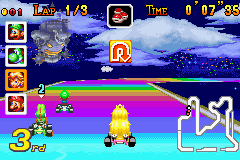 Mario Kart 64’s Rainbow Road is one of the longest tracks in the series; there is plenty of color, and you could see neon lights of racers in the background. The music is still the best any Rainbow Road has offered, if not one of the best soundtracks in any Mario Kart game. 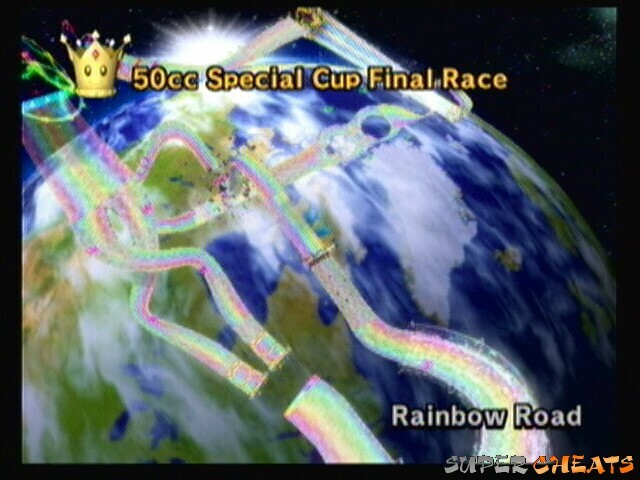 Unfortunately the course’s layout is very basic compared to later Rainbow Roads. While the N64 version has color and an amazing soundtrack, if you took those away it would be a boring course. 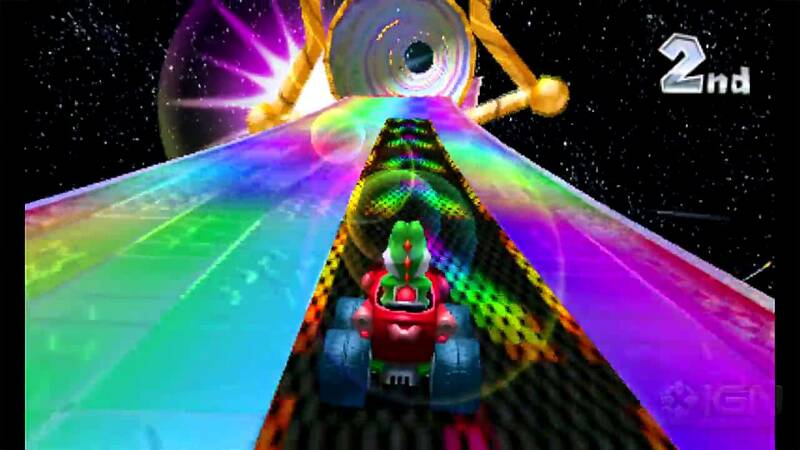 It did, however, set the standard for the Rainbow Road tracks that followed it. Nintendo delivered another great Rainbow Road track with Mario Kart Wii, it was fun that now you can go up ramps and do tricks in space. The colors flowed well with the track, as do all the rainbow roads. Next to the SNES, Mario Kart Wii had the hardest rainbow road; there were few guardrails to protect you, and a slight mistake will send you flying off the track. There is one thing that sets this Rainbow Road from the others; you can now fly through parts of the course. That alone is awesome, but wait, there’s more! The stars and planets in the background look incredible; there are booster rings in the air, you drive through giant spinning tubes, and you can drive on a lunar surface. On top of all of that it has the best soundtrack outside of the N64 Rainbow Road. I find nothing wrong with this course; it’s creative, fun, and the right difficulty. Exactly why it tops this list. So what did you think of this list? Agree? Disagree? Love? Hate? Or more importantly, does it hype you up for Mario Kart 8? Join the discussion in the comments! Both of the Rainbow Road's in Mario Kart 8 blow the rest of them out of the proverbial water lol. You'll agree in a couple days when Mario Kart 8 is released in your region lol. I was expecting the Rainbow Road from Double Dash to make the list. The wait for Mario Kart 8 is almost over! Really surprised to see the N64 version on it. Absolutely think this is one of the most boring tracks in a Mario Kart game ever. Just so boring and why is there a fence around the entire track. Rainbow Road for me is all about the danger of falling off. I have to say that I really like the new Mario Kart 8 update though. @FM_Alchemist wrote: I was expecting the Rainbow Road from Double Dash to make the list. @Sneaker I admit the track is mediocre, but the music is still my favorite of any course in any Mario Kart game. As I said, take the music away and the course would be very boring. As for Double Dash's rainbow road, it was a close call between that and Super Circuit. The only RR track I didn't like was the SNES one. Of course all this is opinion, we all have our favorites. I'm loving Mario Kart 8, I hope everyone else is too! Thanks for publishing yet another amazing feature @Gamergy! My personal favorite Rainbow Road track is the one from Mario Kart: Double Dash, though I agree that Mario Kart 64's Rainbow Road has a great soundtrack! However I have watched replays of the MK8 remake of the course on Youtube and that version sounds even more amazing. @Rukiafan Let me just say this: you are in for a real treat. MK8's rainbow road deserves to be higher than n64's at the very least. N64's rainbow road should come nowhere but dead last, in fact it might be the worst track overall in the whole Mario Kart series, though I agree that the music is the best. I agree that MK7 should probably be at the top of the list, though I disagree with you on the music, always felt like a bland n64 remix to me. @Stevo94 take a look at the article's date lol. It was written before Mario Kart 8 was released. MK8 is favorite of my.